I just have to look at this dish and I feel energised. Beetroot hummus, thyme and honey roasted carrots and broccoli florets make a delightfully colourful appetiser to entertain a crowd and ensure that your loved ones get an antioxidant hit. Hummus is such a practical, nutritious food which originated in the Middle East and has spread far and wide. In the last 8 years or so, the hummus market has exploded in New Zealand, with many new players and numerous variations of this humble dip. However, why pay so much for a super cheap food that you can make so easily at home? And what about those little plastic containers which have to be shipped off to China to supposedly be recycled? Not to mention all of the additives, preservatives and whateverives which are present in the store-bought varieties. Take control of your diet, grab a food processor and get stuck in. You can play with this recipe as you like. If you want to reduce the oil content, or omit it altogether, add an equal quantity of water. Or if you have a juicer, juice a beet or two, add it to the mix and watch the colour brighten. I am a firm believer in adding good quality fats to your diet where possible and there are some über-healthy fats in this dish to make your skin glow and hair glisten. Olive oil, sesame oil and tahini provide a wonderful combination of vitamins E and A, calcium and carotenoids, which protect your cells from the damaging effects of free radicals and enhance the functioning of your immune system. Broccoli, carrots and beetroot also provide a hearty dose of folate, vitamins A, K and B6, as well as ample dietary fiber to aid digestion and ensure optimum health and vitality. The beautifully designed ceramics featured in the photo are available from Whiteroom – Dunedin’s design destination. Preheat oven to 190ºC. Place the cubed beetroot, himalayan rock salt, pepper and sesame oil in a roasting dish and bake for 40 minutes until cooked. Place all of the ingredients in a food processor and whiz. Extra oil, water or beetroot juice may be added to obtain the desired consistency. Place carrots in a separate roasting dish. Add the honey, olive oil, thyme, lemon juice, salt and pepper. Roast carrots for about 4o minutes until nicely cooked. Blanch a head of broccoli which has been chopped into florets. 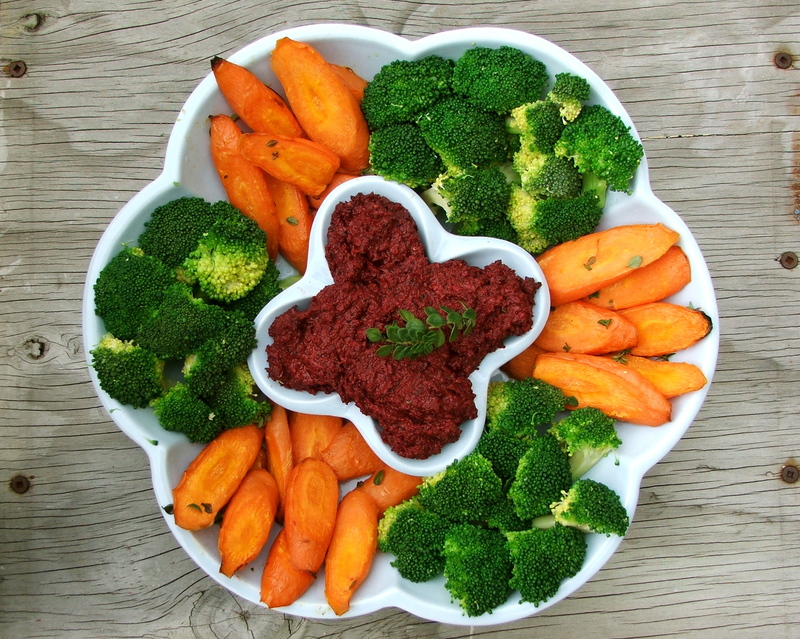 Arrange beetroot hummus, thyme and honey roasted carrots and broccoli on a platter and serve. Reblogged this on Super Foodie Adventure.